The Martyrs of Christ are the greatest resisters in the history of mankind. They resisted violence, authoritarianism and delusion with the power of their sacrificial love that gives life, and not by the power, or we should rather say weakness, of hatred which kills. 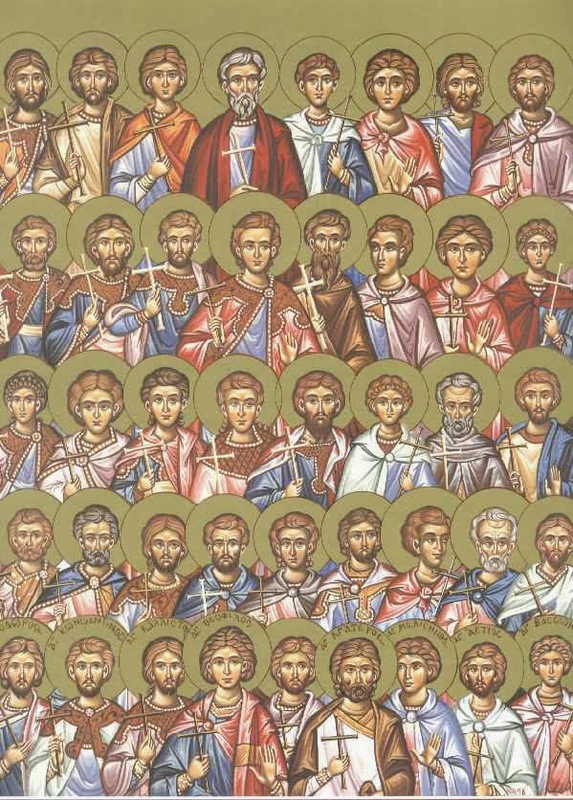 The Holy Martyrs, free of the tyranny of the passions and demonic falsehood ("the idols of the nations are demons"), experienced the truth as reality in the person of the Word of God ("I am the Truth") and freedom as the subjugation of the flesh, or carnal mind, to the spirit. Because they experienced God's presence sensibly in the regeneration of their existence by the Holy Spirit, this is why they endured to the end without bending even to the most inhumane tortures. They sacrificed themselves, like Christ, that others may live, and did not sacrifice others that they may live. The various ideologies, as constructs of passionate people, are unable to offer life. Rather, they can even cause death, pain and suffering. In the name of a pharisaical or rather demonic justice they reduce human lives to better, as they claim, human societies, removing them from the elements which, in their opinion, prevent their progress. That is, they try with violence and killing to regenerate humanity and kill others that they may live. The Church has an innumerable multitude of martyrs not only from the first three centuries after the birth of Christ, but even throughout the period of the Turkish occupation, as well as from before the fall of Constantinople. In the period before the fall, Turks and Arabs attempted many wars of conquest against the Roman Empire (Byzantium) and occasionally conquered several cities. In 838 the Arabs conquered Amorium, a city of Phrygia near the Sangarius River, which since the sixth century was the official military center of the empire in central Asia, and they completely destroyed it. Today not even the foundations of the city have survived. Led by Caliph Mu'tasim the Arab Muslims captured and killed seventy thousand people. Among the captured were forty-two preeminent political and military men, who were dragged to Baghdad and thrown chained into a sunless dungeon, a true hellhole. They were left in there for a long time, and given only bread and water in small quantities. When they arrived at a point of complete exhaustion they were asked to renounce their faith and become Muslim. At first they tried to cajole them and promised them money and honors. When they refused, the martyrdom continued. They suffered tremendously, but remained steadfast in the faith of Christ. After being cruelly tortured they were beheaded and in this way they sealed their confession for Christ with their blood. Martyrdom, as it is often stressed by His Eminence our Metropolitan Hierotheos, is not the result of a mighty character and a strong will, but of the purification of the heart from the passions, illumination of the nous by the uncreated Grace of God and the vision of God. With purification, illumination and deification one receives the fullness of uncreated Divine Grace felt in one's soul and body, and this is why death is not feared, but rather martyrdom is desired. And when a confession of faith in Christ is made essentially the one undergoing martyrdom is recounting everything they saw and heard, since they know God existentially, Who reveals Himself to the "pure in heart". For it is one thing to believe in God and another thing to see Him. Cerebral or intellectual knowledge is one thing and existential knowledge or divine communion is another. The personal knowledge of the personal God of the Church is called faith according to theoria (vision) and is associated with the transcendence of death in the limits of ones personal life. The martyrs withstand torture and do not bend in the face of death because they are in fact dead and resurrected. They have an amazing bravery that is not of this world, but is the fruit of their relationship with the almighty God, the ruler of life and death. 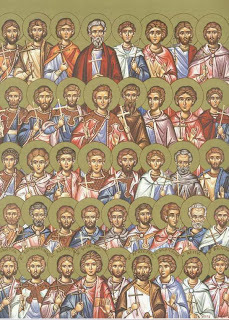 The Forty-Two Martyrs of Amorium within the prison were free, because their soul could not be captured behind walls and bars. In the most adverse conditions they maintained internal peace, derived from continuous prayer. Although they suffered, they did not hate their tormentors, but prayed for them with love. You cannot encounter this in any of the various ideologies. Love for enemies doesn't exist in them, and those who are regarded as enemies by these carriers of ideologies are often killed without hesitation in order to consolidate, as they think, society. Ideology is a transient phenomenon, a construct of passionate people. The Church is not a human creation, but God's revelation. The Church, which has always existed in the pre-eternal counsel of God, is revealed and realized as the Body of Christ on the day of Pentecost. It is called a religion, but in reality it is a revelation of God Himself and not a discovery of man. The Church, as the true Body of Christ, with the uncovered truth that it holds, helps humanity to be healed of ideologies, that generate aggression, hatred and terrorism, and brings them to experience true love, which is the real ticking bomb, but it enlivens, vitalizes, regenerates and humanizes human societies. Source: Ekklesiastiki Paremvasi, "ΑΓΙΟΙ ΣΑΡΑΝΤΑΔΥΟ ΜΑΡΤΥΡΕΣ ΑΠΟ ΤΟ ΑΜΟΡΙΟ", March 2003. Translated by John Sanidopoulos.